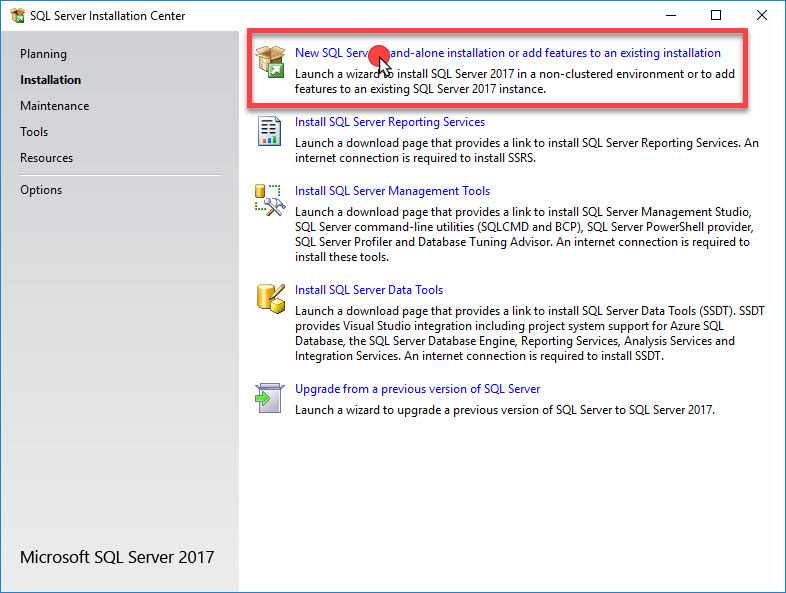 In this document it will be shown how to download, install and configure the SQL Server. 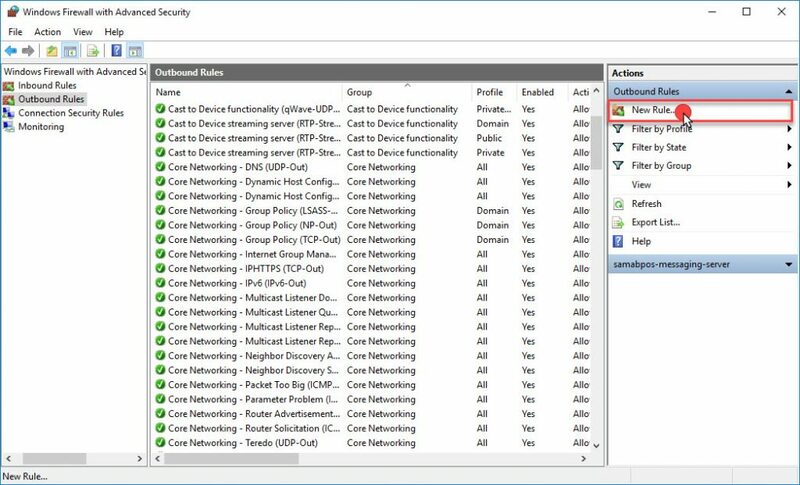 You can use many PC in a network by this way. 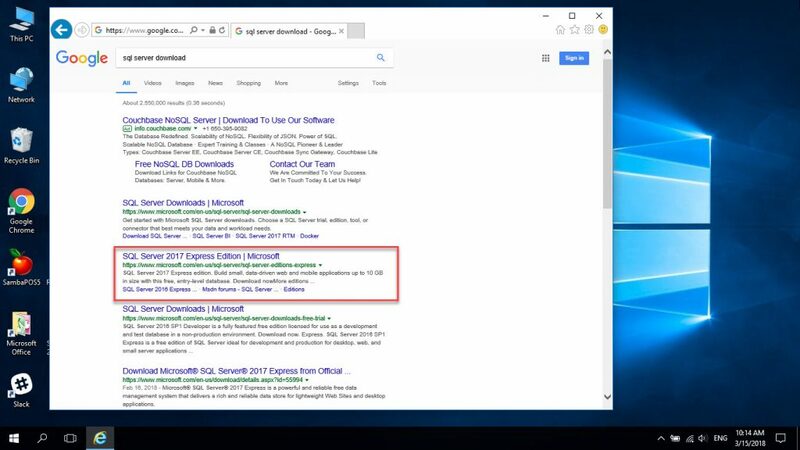 Search in Google “sql server download”. 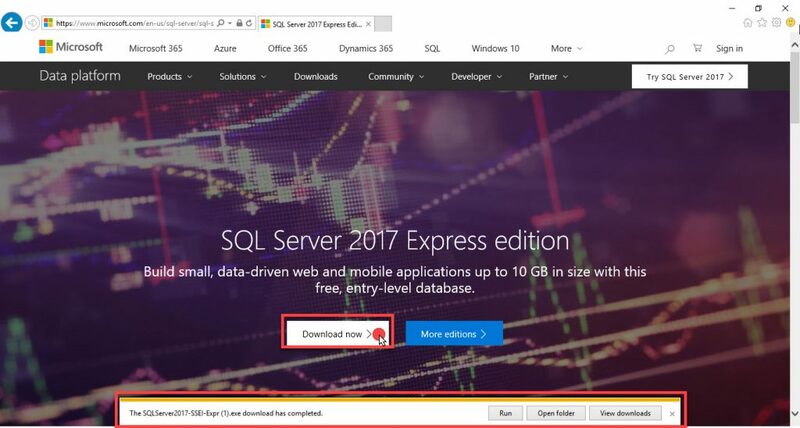 Click on SQL Server 2017 Express Version link. 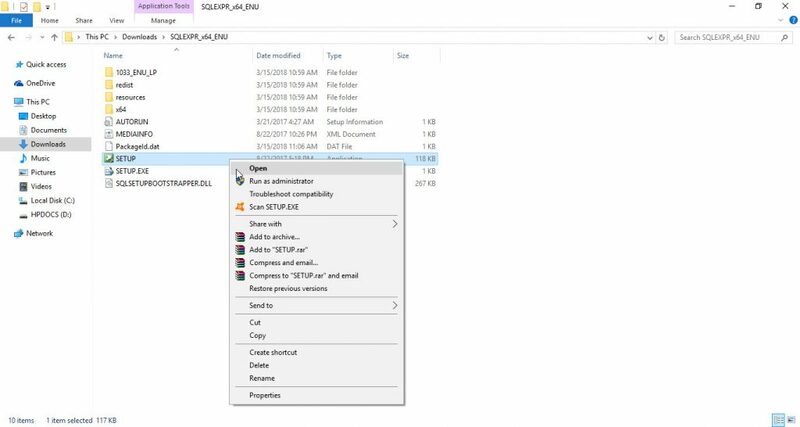 Click on Download button and download the file. 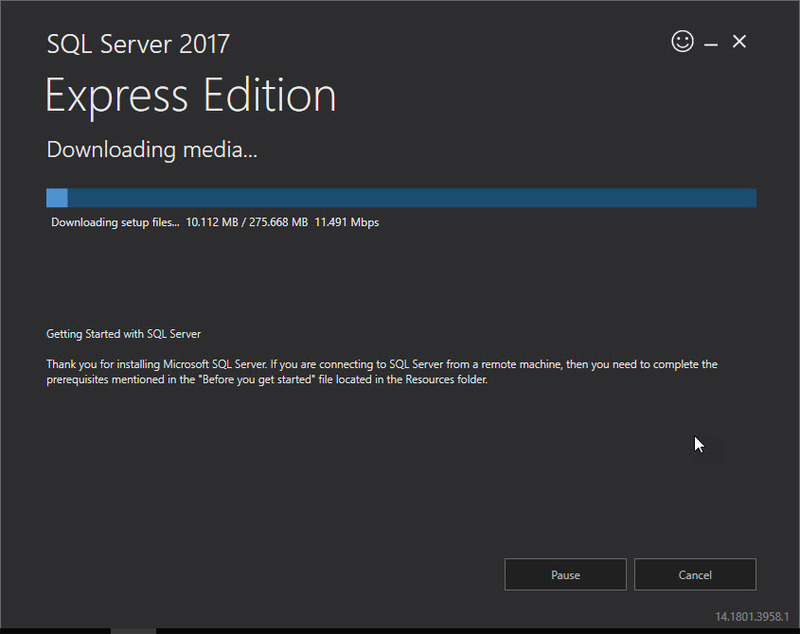 Run the .exe Select Download Media. 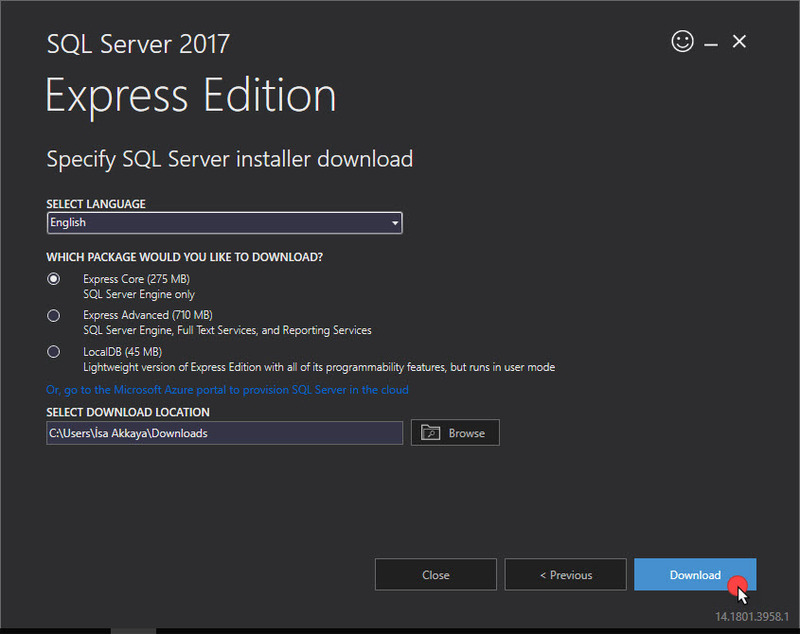 Select language and Express Core (275 MB) then click on Download button. 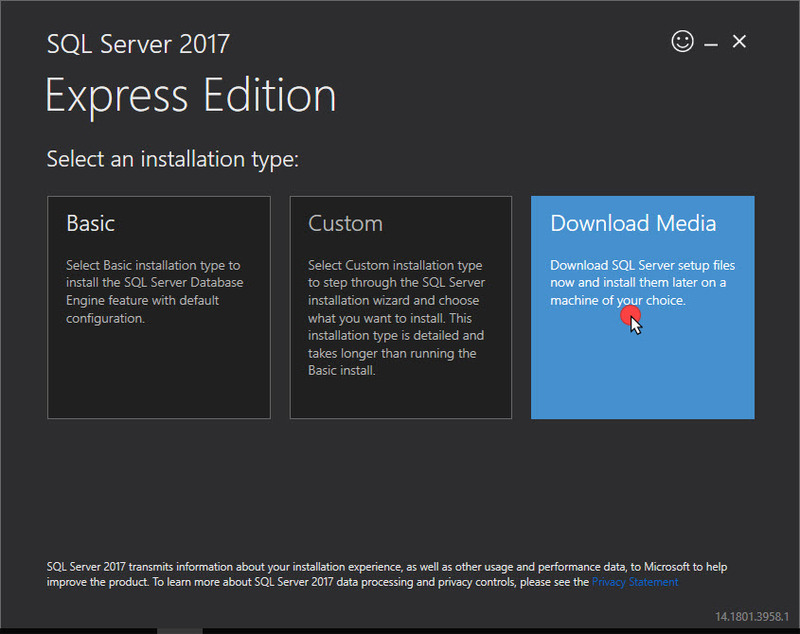 SQL Server 2017 SP1 Express Edition will be downloaded. 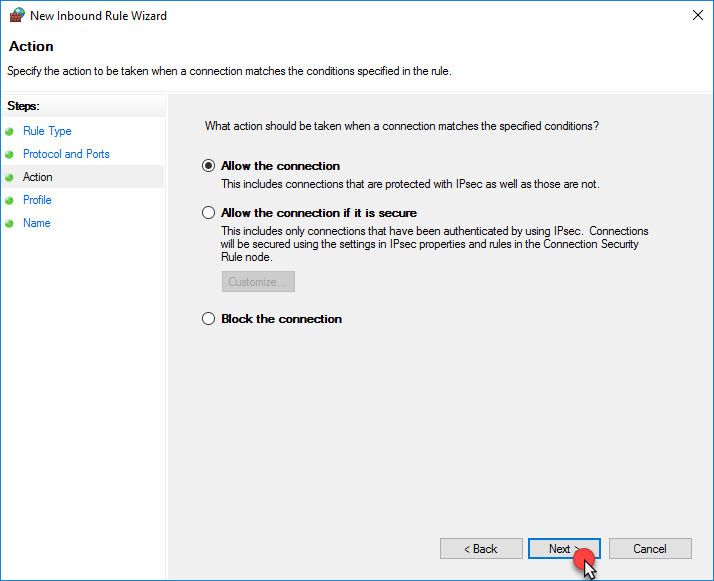 Click on SQLEXPR_x64_ENU and run(open). 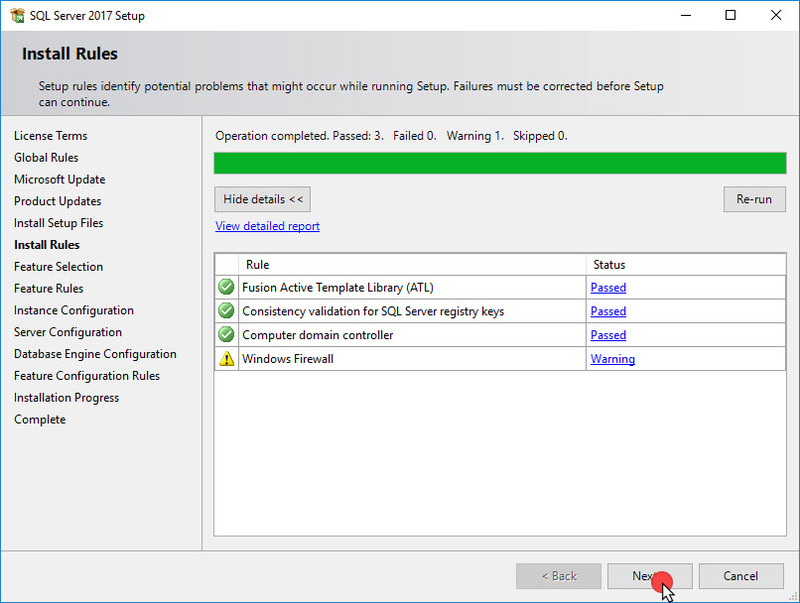 Click on SETUP and run(open) SQL Server Setup will start. 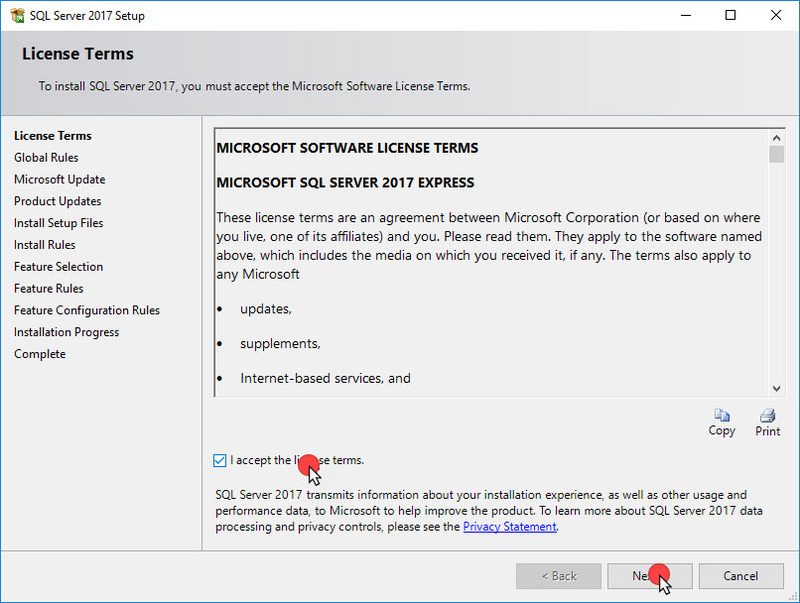 Click on I accept the license terms and Next button. 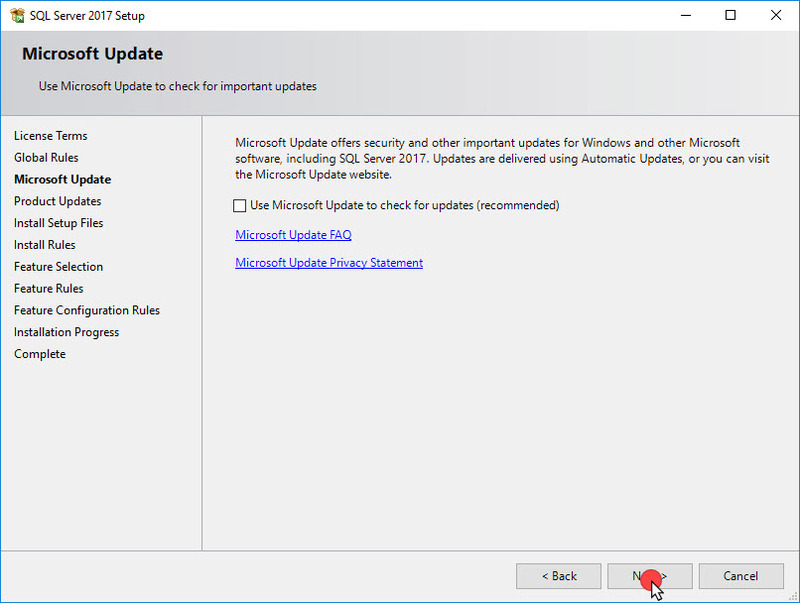 Click on Next button for update check. 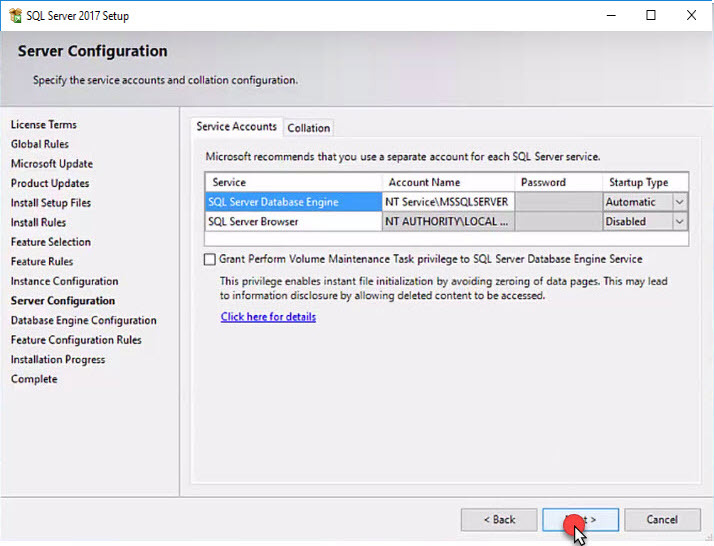 Select only Database Engine Services and unselect the others. Click on Next button. 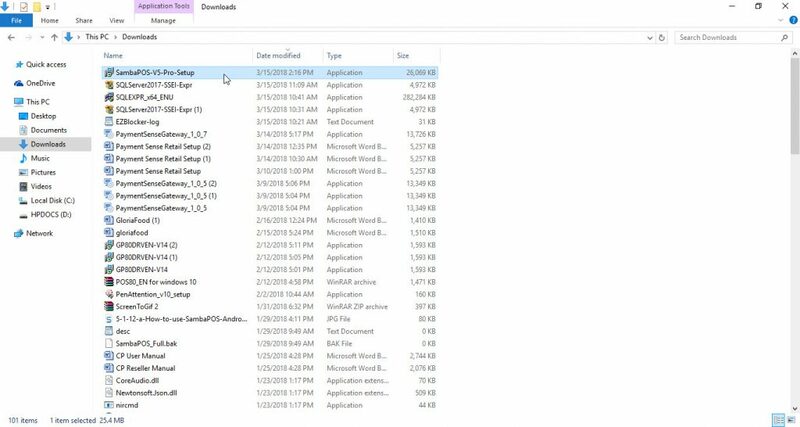 Select Default instance. 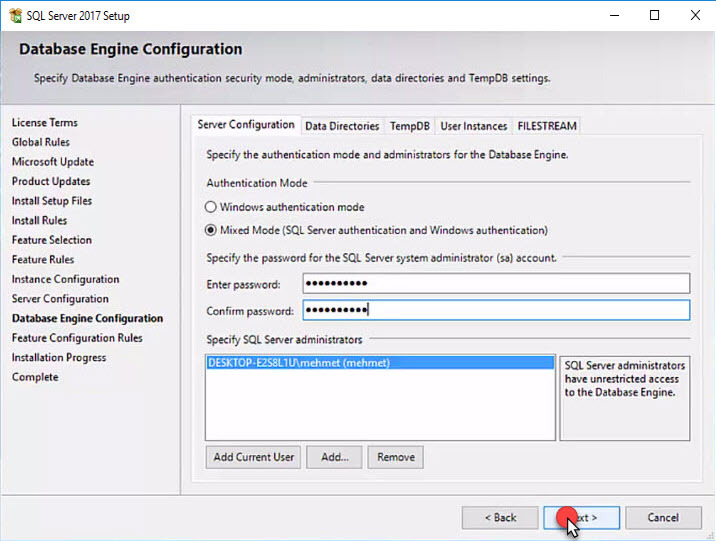 In Database Engine Configuration select Mixed Mode. 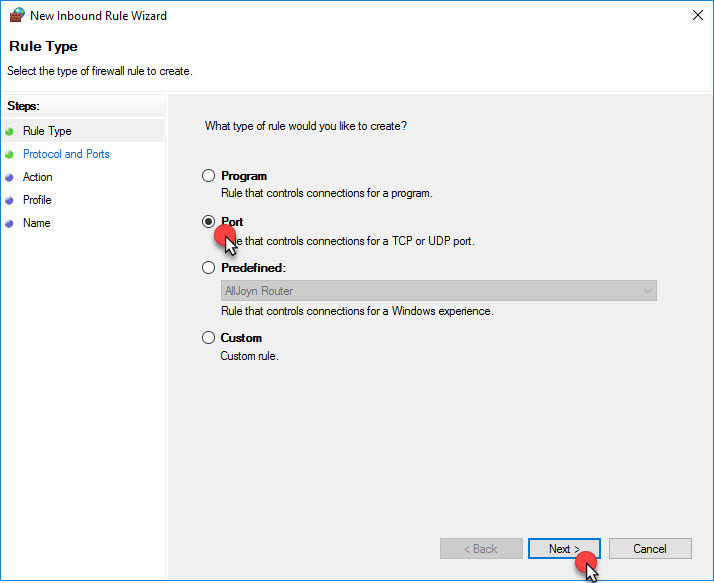 Click on OK button to restart computer. 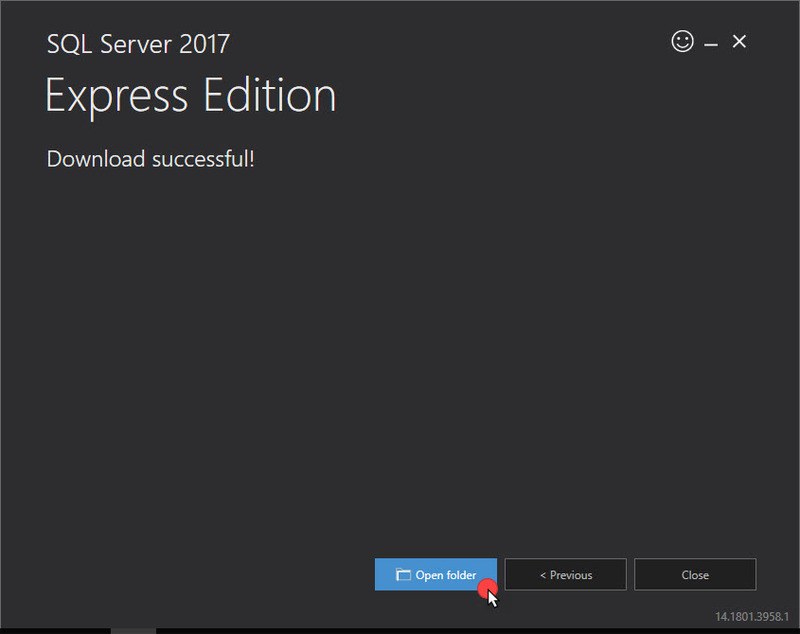 Click on Close button and close the window by clicking on X button. 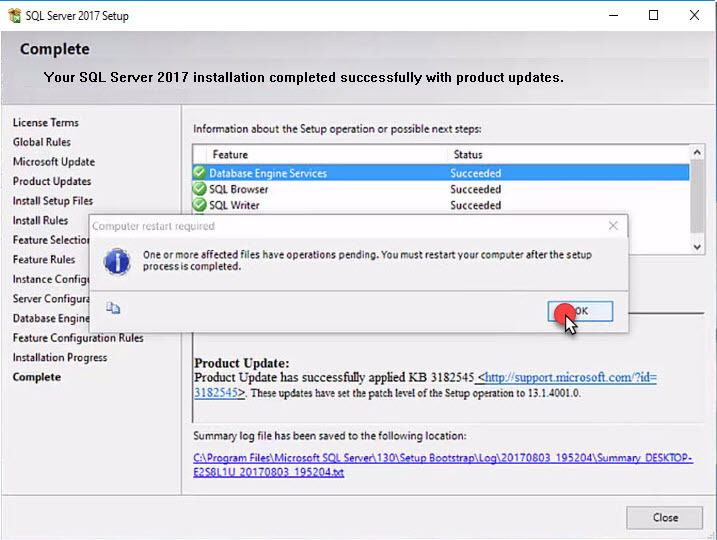 Installation and setup completed. 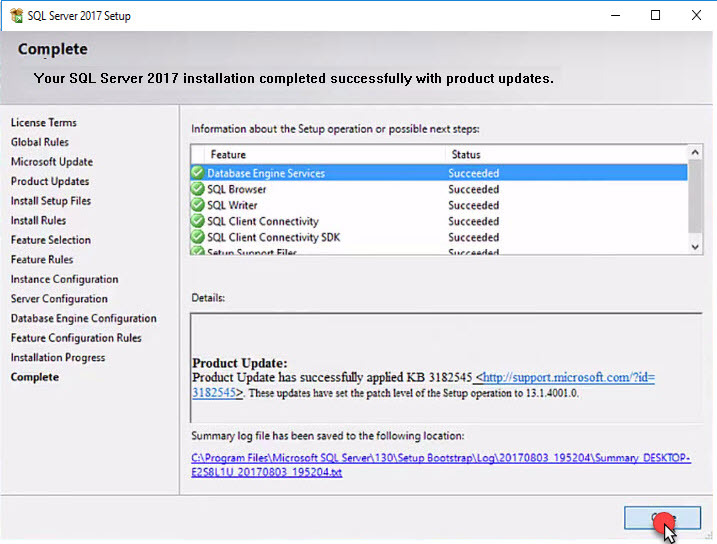 SQL Server is ready to use. 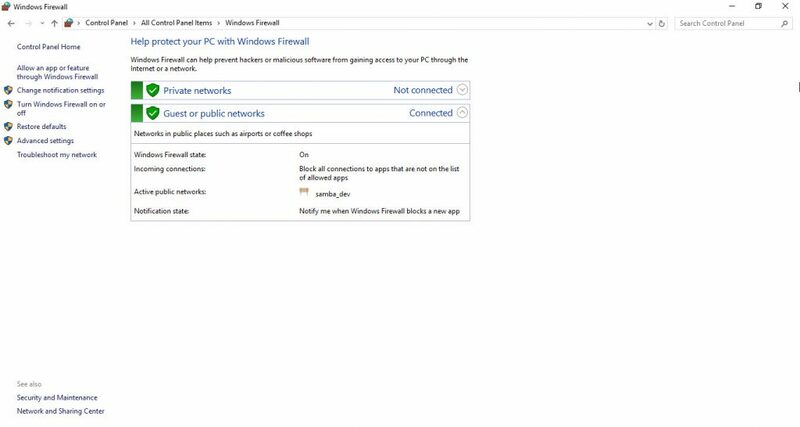 You need to configure Windows Firewall Settings. 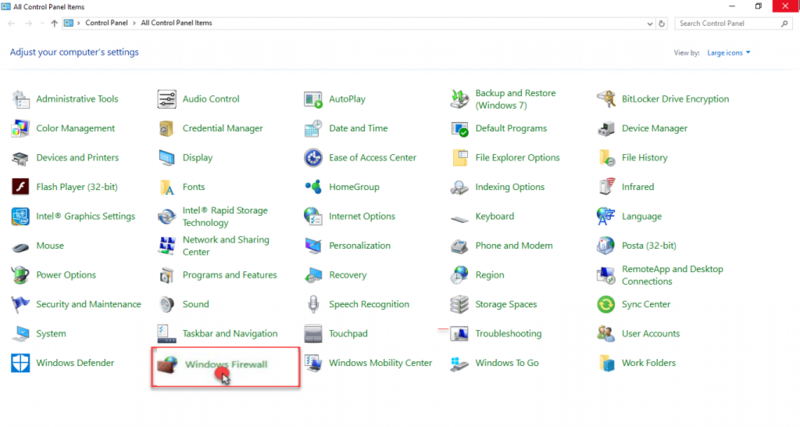 Go to Control Panel > System and Security > Windows Firewall. 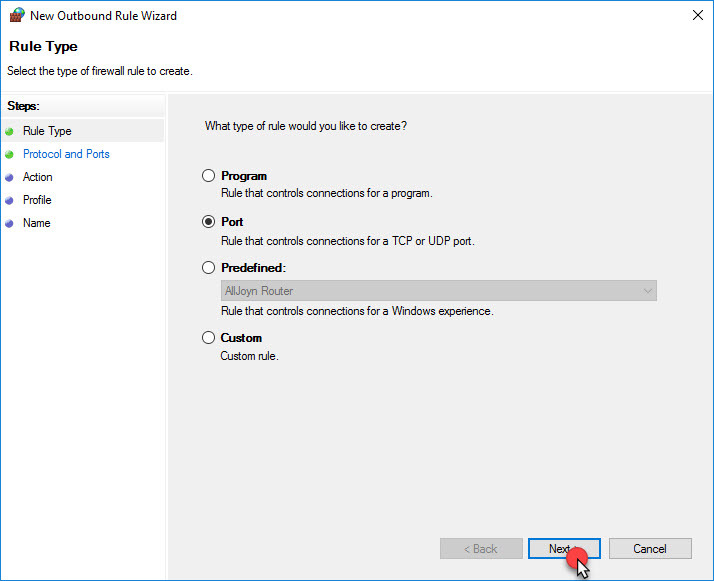 Click on Inbound Rules and click on New Rule. 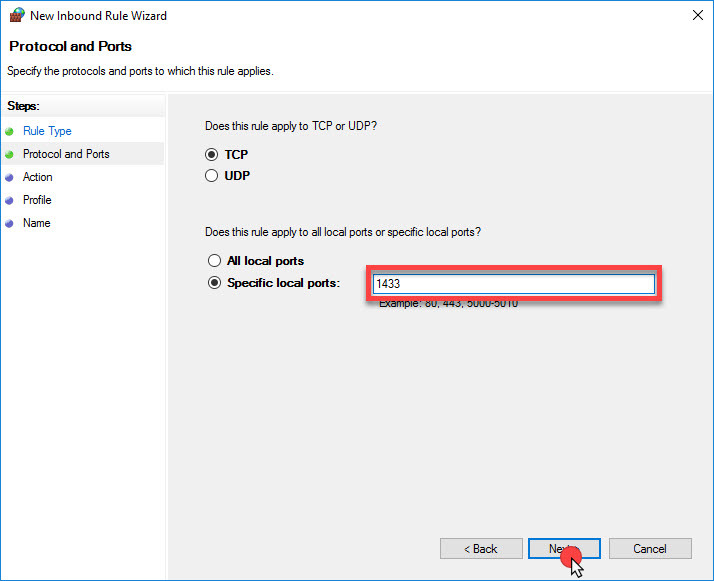 Click on Rule Type, select Port and click on Next button. 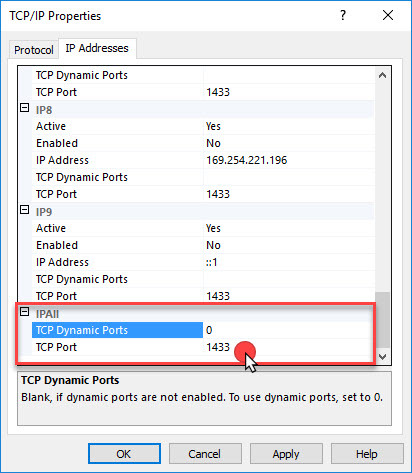 Select TCP and Specific local ports in Protocol and Ports then write 1433 in box and click on Next button. Select Allow the connection in Action and click on Next button. 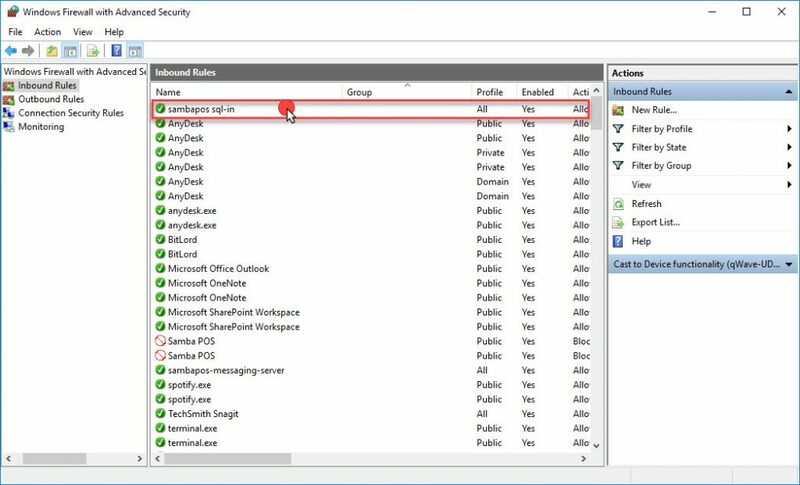 All boxes must be selected in Profile. Click on Next button. 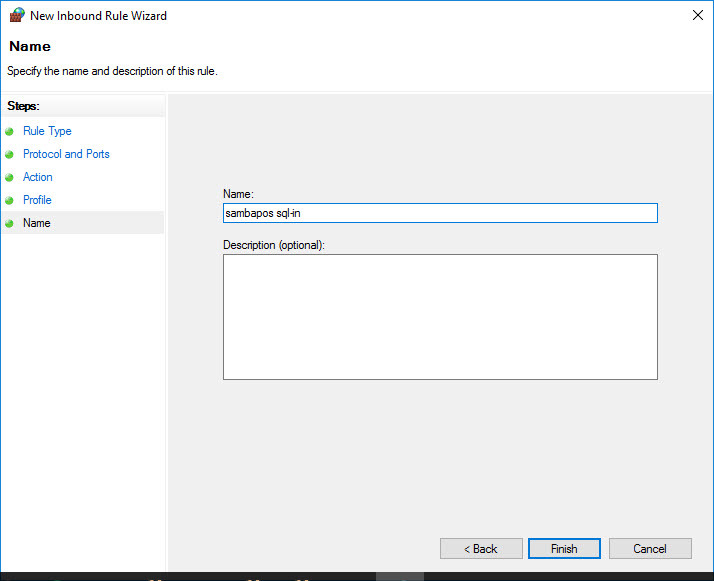 Give a name to the rule in Name section and click on Finish button. Click on Outbound Rules and New Rule. Select Port in Rule Type and click on Next button. 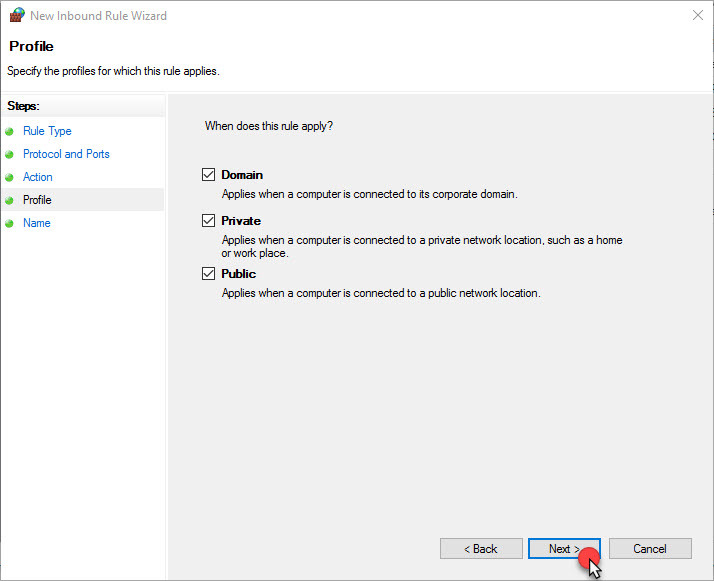 Please do the same settings for internet security or firewall software if you have. 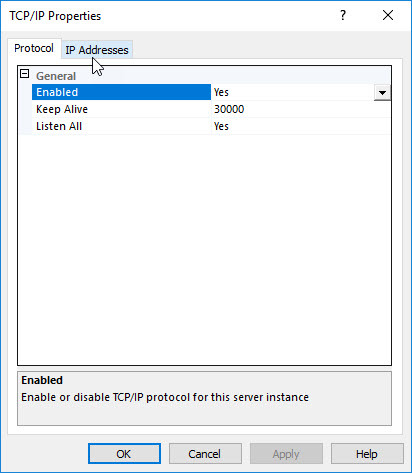 Click on Protocols for MSSQLSERVER in SQL Server Network Configuration. 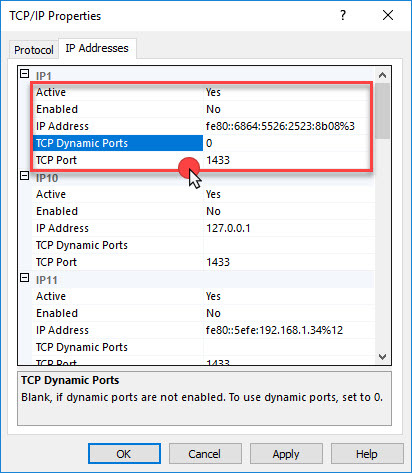 Right click on Named Pipes ve TCP/IP default and Enable both. Click on OK button. 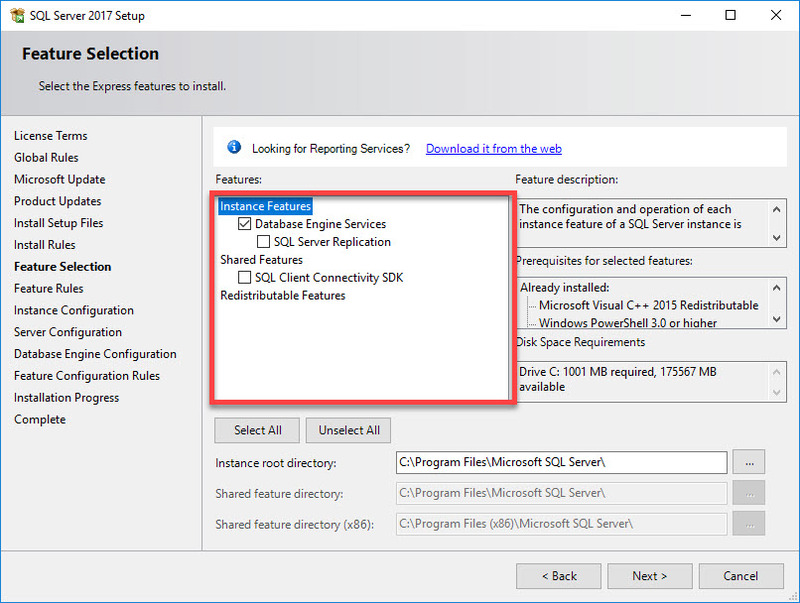 Right click on SQL Server Services SQL and Restart. 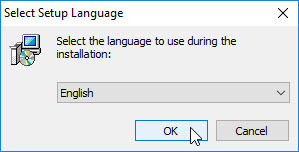 Select the language and click on OK button. 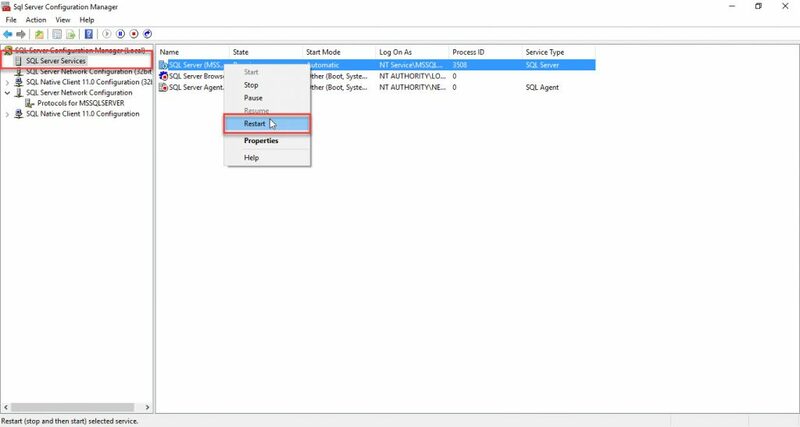 Select only Sample Data, unselect the others and click on Next button. SambaPOS installation will start. 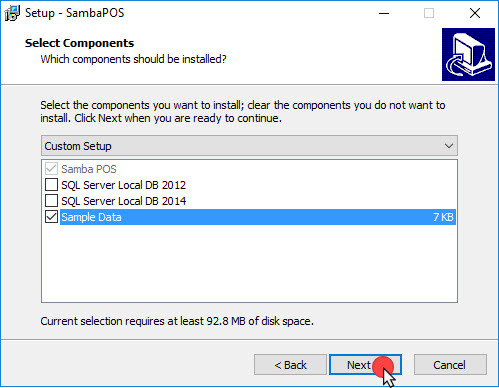 The other settings will be made in SambaPOS when the installation was completed. 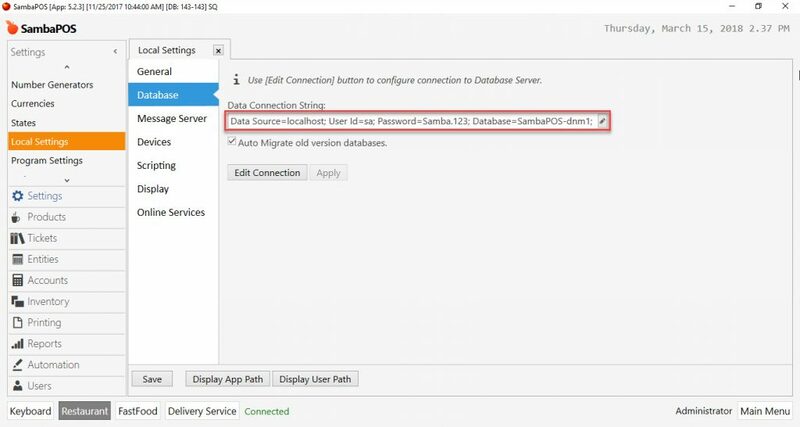 Run SambaPOS and go to Main Menu > Manage > Settings > Local Settings > Database. 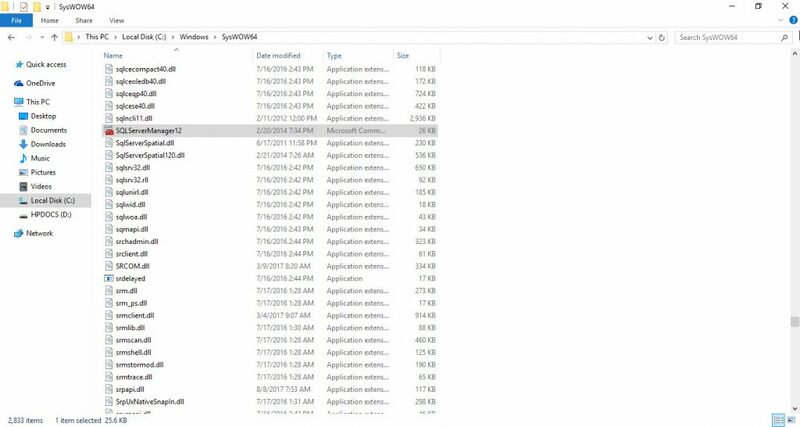 Data source: Name of PC. 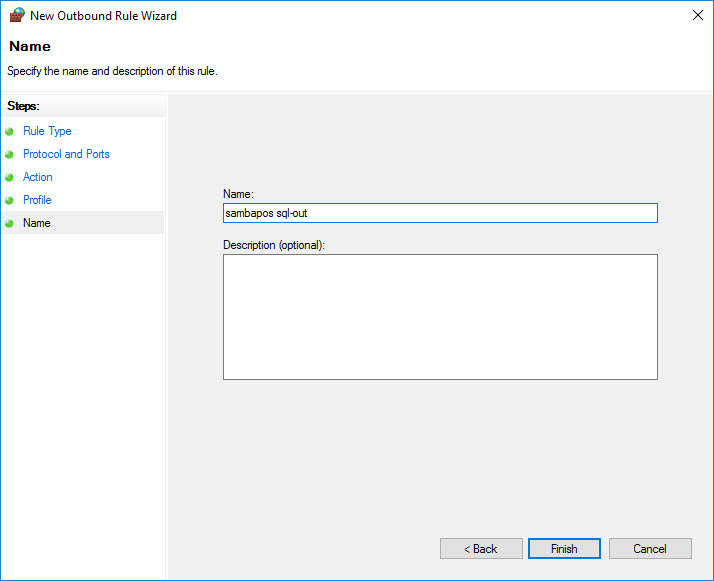 Password: Write the password defined for Mixed Mode in SQL Setup. 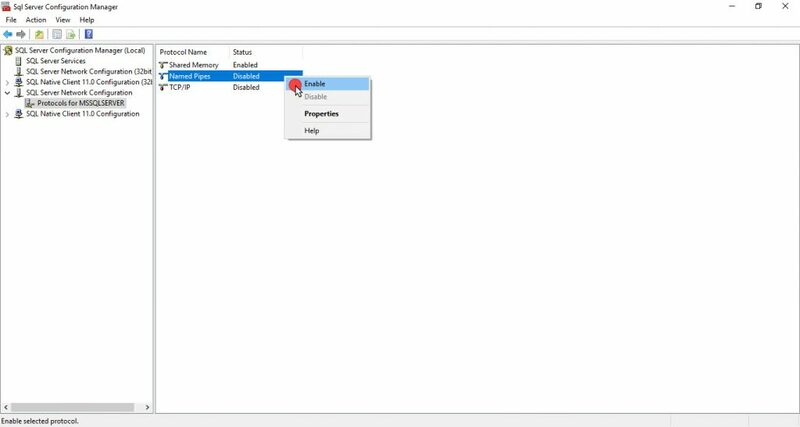 Database: Give a name for database. Click on OK button. 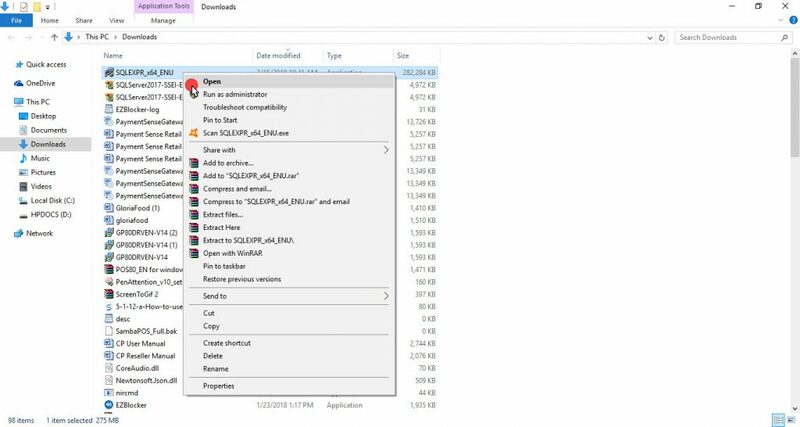 Click on Save button and shut down SambaPOS completely and restart. 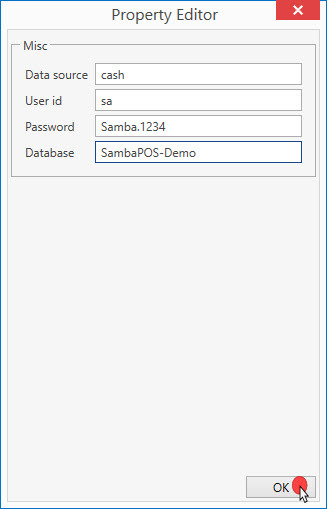 SambaPOS will connect to database when you restarted. Now it is ready to use. 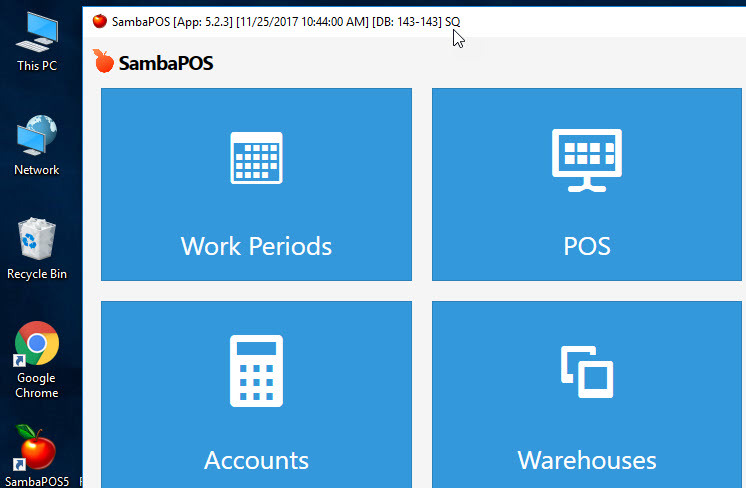 Click on SambaPOS logo on top left corner to minimize the SambaPOS. You can see the SQ letters. 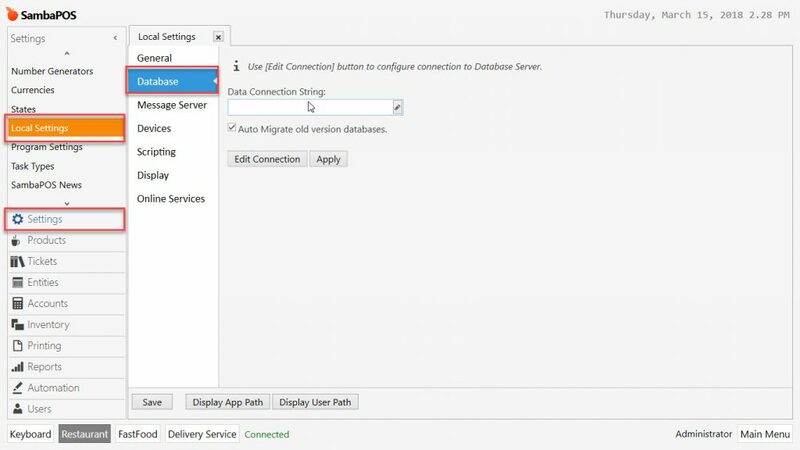 It means that you are connected to database correctly. 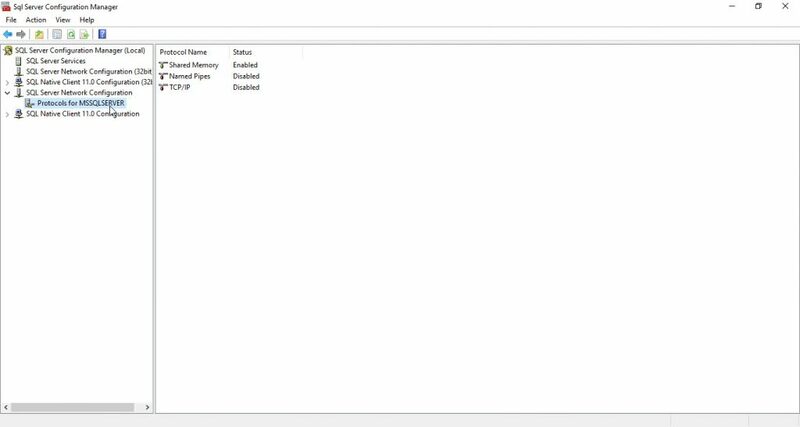 If you go to Main Menu > Manage > Settings > Local Settings > Database , you can see the connection string. 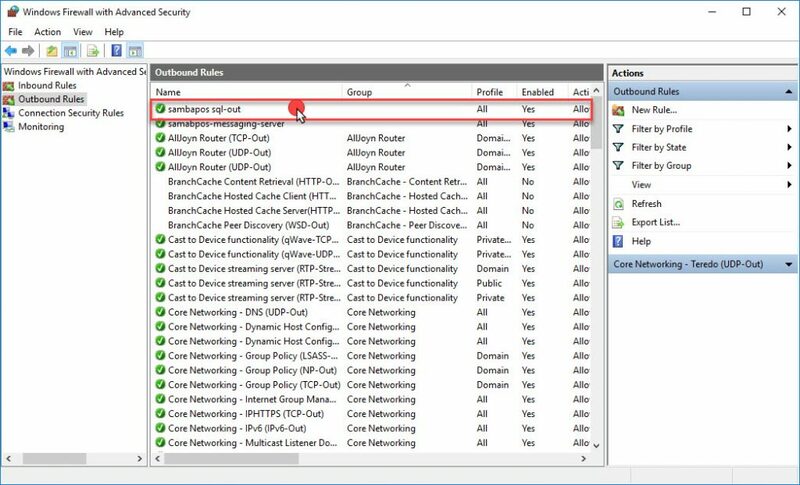 These settings must be done for the all clients in network. 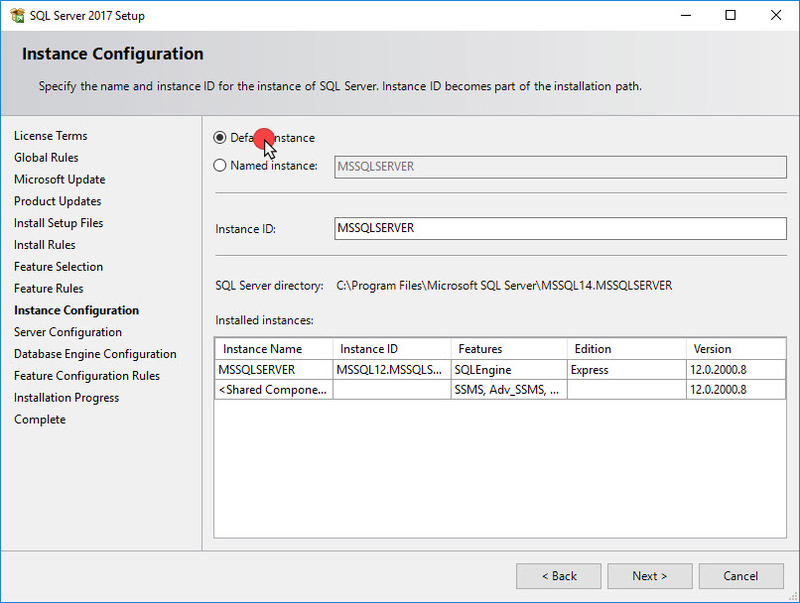 The name which used for Data source in SQL PC must be used in all clients.